The corset should be cut at least 5 centimetres smaller in circumference than the measurement of the wearer, so that it can be laced tightly to pull in the superfluous flesh. Across the curved neckline the word breathe is embroidered in stumpwork. 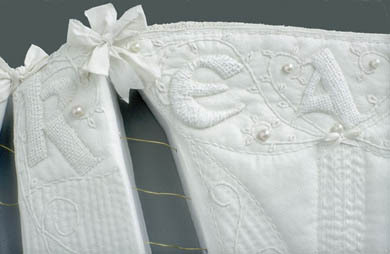 The letters that fall on the central panel read eat at the neckline and less on the waistline at the base of the panel. These words breathe and less are designed on the neckline and hem of the corset so as to suggest to the viewer the curving movement of the chest as the wearer breathes in and out. The corset panels are laced through with brass wires that twist together onto an old iron handle that is inserted directly into the wall. The lines of the wires visually reinforce the breathing motion of the chest as if the corset is about to be wound in to create the desired curvaceous silhouette with its tiny waistline. at the ANCA gallery in 2004. This page was last updated on 24 December 2018 .